Wendigo Duo, 2 player games, Play Wendigo Duo Game at twoplayer-game.com. 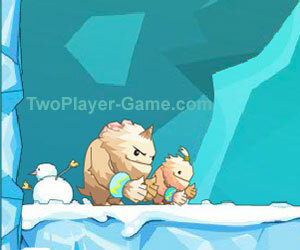 There are two snowman live in the arctic continent,one of is bigger,one of is smaller,they are brothers and always play together.One day,they decided to go out for adventrue.The purpose of this adventure is looking for the legendary fairyland.But many dangerous creatures also live in this world of ice and snow, it means that their adventure will not be smooth,you need to use your wisdom and courage to help them out of the woods. WASD to move and climb. can smash icicle and enemy(when boxing glove got). W to throw partner/place ladder/climb edge. Arrow keys to move and climb. ↑ to place ladder,↓ to dig brick(when shovel got).